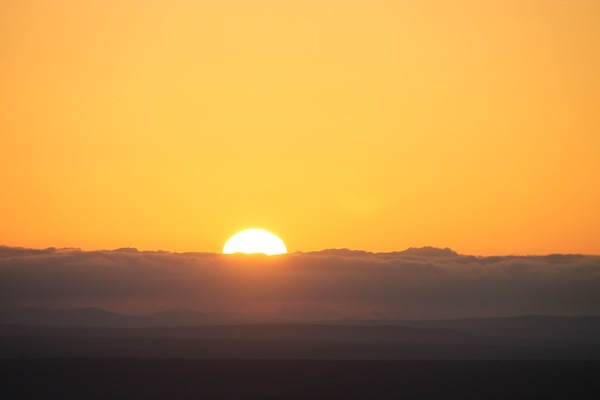 Sunrise on the Maasai Mara, seen from a hot-air balloon. ON THE MAASAI MARA, Kenya — During a recent Kenya trip, I had a few opportunities to do game viewing from the air, in some cases from small aircraft when traveling to and between tent camps and once on a helicopter tour of the Rift Valley just outside of Nairobi. 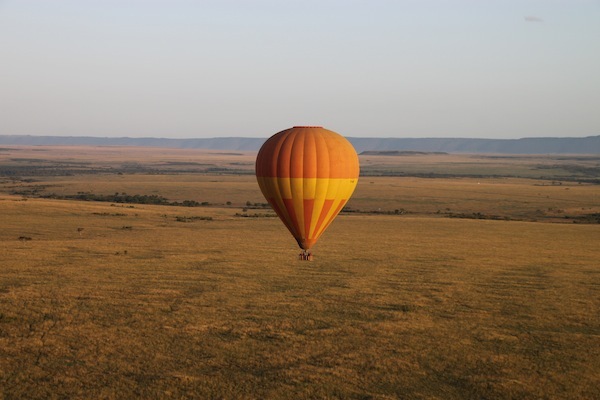 But the best choice for overflying the animals — for great views of the animals as well as their home turf — was the hot-air balloon ride operated by Kenya-based Balloon Safaris, Ltd. I was in Kenya with other travel journalists, hosted by the Kenya Tourism Board. 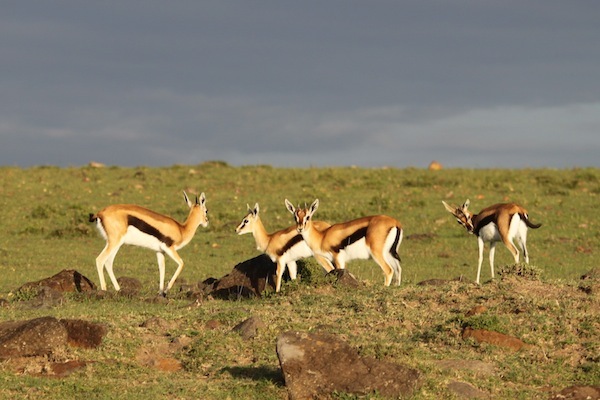 This particular excursion started at the Mara Plains tented camp, owned by Great Plains Conservation and located on the Olare Motorogi Conversancy, adjacent to the Maasai Mara National Reserve. You don’t have to be a daredevil to take a hot-air balloon ride over the Maasai Mara in southwestern Kenya, but this is not for sissies. It’s not for the lazy either. We were up early enough to depart by around 5 a.m. We needed to be at the launch site, about half an hour away, in time for lift-off before sunrise. It was chilly being out and about at such an hour, even in June. During the ride to the launch site, we discovered that our four-wheel-drive transport came stocked with nicely lined ponchos. They were a lifesaver for this and other brisk early morning activities. I can clock the journey by looking at my photographs. I took my first shot at 5:30 a.m. of the balloon on the ground, just being filled with air. The first shot in the sky was at 5:45. In the intervening 15 minutes, we passed through a short security check then were lifted into the air. As for takeoff, initially we were sitting down, but in a horizontal position, until the basket could be moved and came upright. Our pilot revved up a fire to heat the air inside the balloon, which in turn kept the balloon blown up to its full size. This was enough to allow us to rise because the air was much thinner and warmer inside the balloon than the colder air outside. One of several balloons that shared the skies with our own. 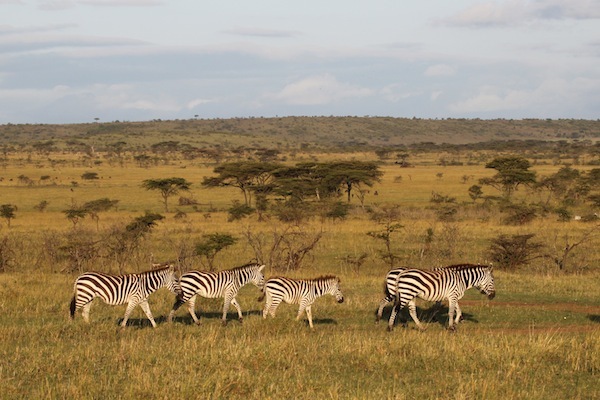 The view also highlights the majesty of the Maasai Mara landscape. Our pilot/guide was an Australian, Capt. Ellie Kirkman, whose husband, Capt. Milton Kirkman, was piloting another balloon traveling in tandem with us. In fact, there were several balloons in the sky and we could photograph them in all directions. We had a beautiful sky and could enjoy views of sloping hills, winding tree-lined rivers and some wildlife below. 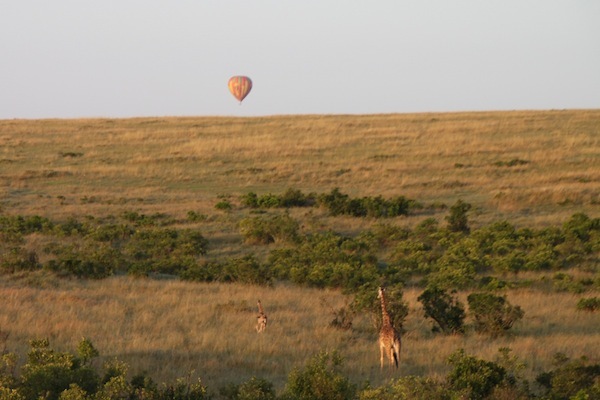 View of the Maasai Mara landscape as well as giraffes moving away from a floating balloon. A second balloon is visible in the distance. The biggest grouping was a really large herd of buffalo. 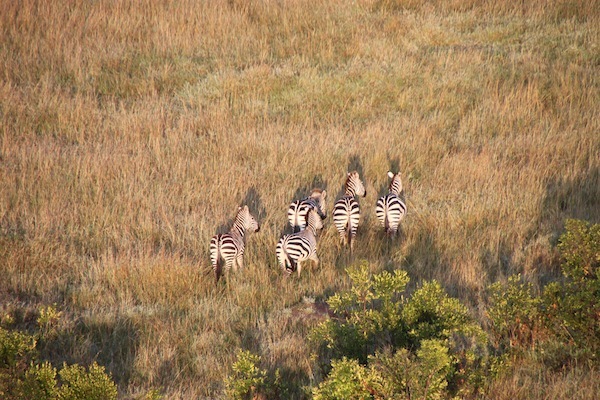 We also looked down on lone or small groups of giraffes and zebras. Sometimes, aware of the balloon or balloons in the sky, they skittered away from us, but not in a great frantic rush. 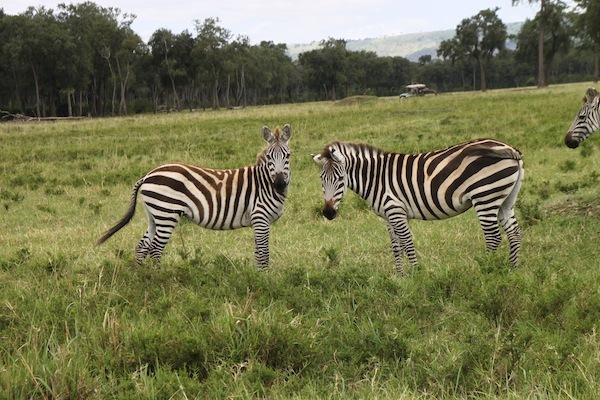 Zebras, sensing a balloon nearby, skitter away. The journey lasted 60 minutes — my last airborne photo was at 6:45 — but went very quickly. We floated relatively close to the ground, it seemed, but, of course, there are no electrical wires or other such impediments on nature preserves to bother us at low levels. 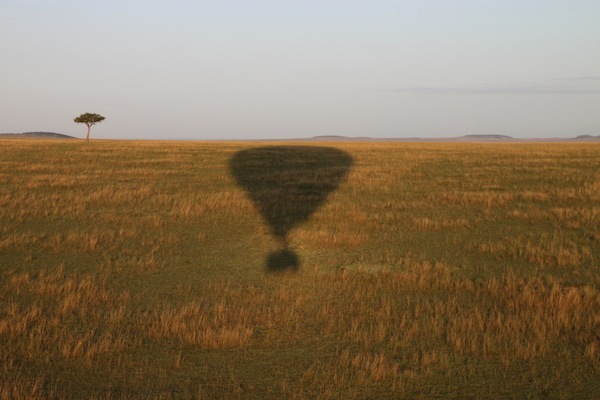 The shadow of our balloon seen against the richly colored Maasai Mara landscape. At its Website, Balloon Safaris, Ltd., lists the cost of the balloon experience at $450 (I took essentially the same trip 10 years ago when, as I recall, that price tag was $300). 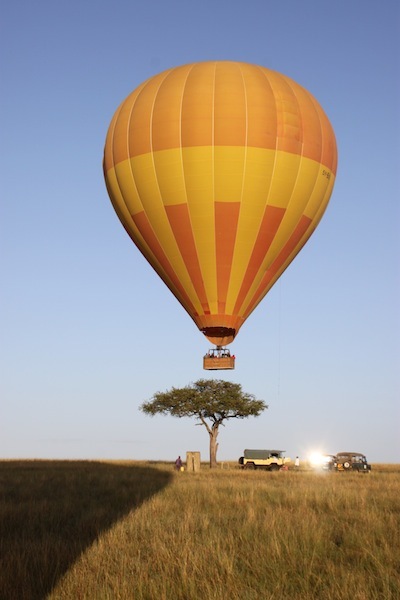 Balloon Safaris designates a specific tree where each flight will end and where breakfast will be served to passengers. As we neared our destination, we were amused to watch the balloon in front of us, piloted by our captain’s husband, head in a direction that would take it straight into the designated tree. Watching a second balloon clear the tree that marks our breakfast site. The flight was followed by breakfast in the bush, with seating at a table under the tree that nearly lost its top. The menu included pastries and croissants, yogurt, quiche, sausages, cereal plus hot drinks. With this, we were primed for a busy day on the ground. After all, the day had barely begun. 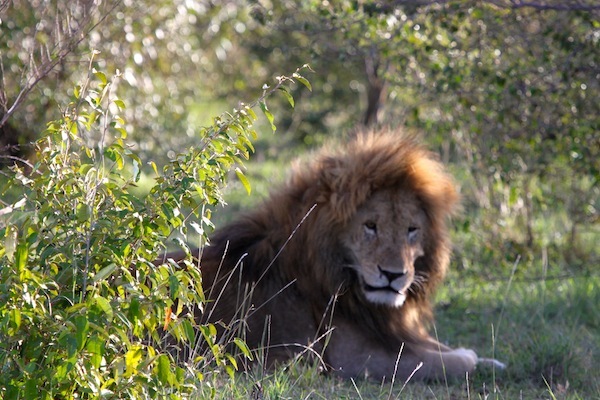 My timed photos show we were already game viewing by around 8 a.m. 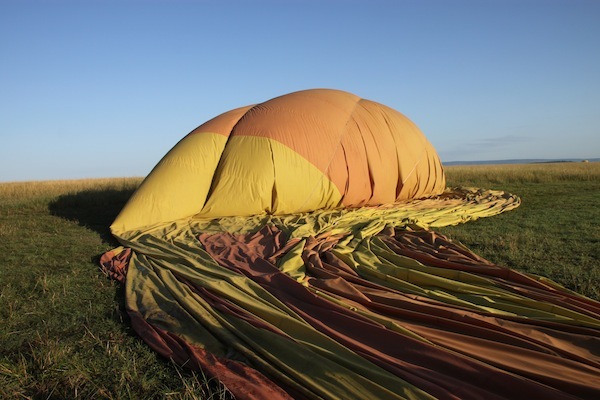 The flight completed, a hot-air balloon deflates on the ground. A family group walks toward us on the Maasai Mara in southwestern Kenya. 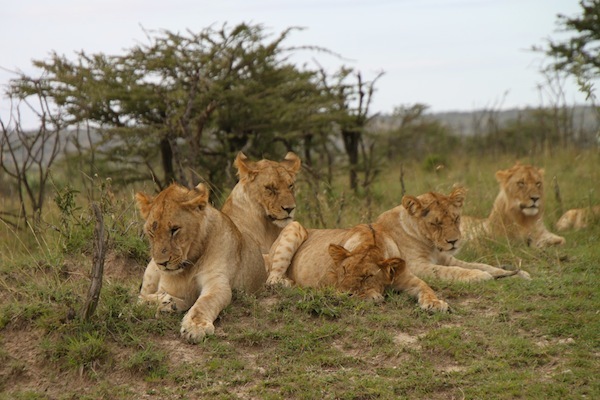 On the Maasai Mara, we watched game on the Maasai Mara National Reserve as well as the adjacent Transmara and the Olare Motorogi conservancies. 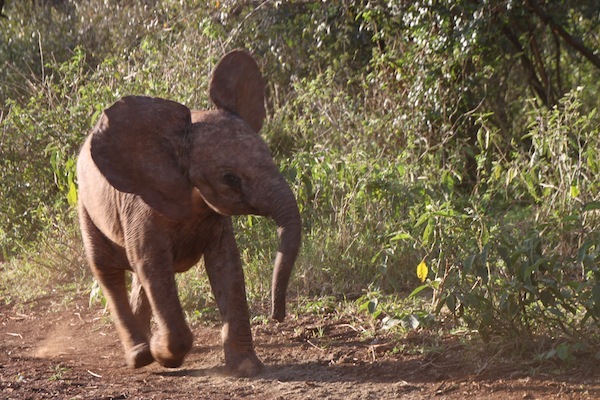 NAIROBI, Kenya — I have a foster elephant, and her name is Kamok. Actually, quite a few people are foster “parents” to the same elephant. 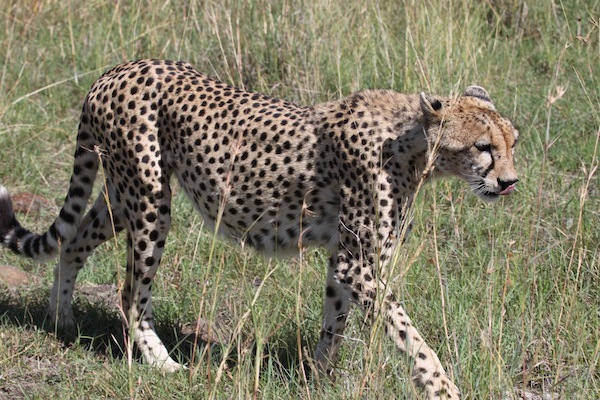 This youngster, born in September 2013 in Kenya, was orphaned at birth (natural causes, it says on her paperwork). David Sheldrick Wildlife Trust’s orphanage for elephants and rhinos, located in Nairobi National Park, took her in. She is among nearly two dozen young elephants at the orphanage available for fostering, a program that engages animal lovers at a personal level and helps fund their care. A couple of rhinos also can be fostered. I visited the orphanage on the last day of a June press trip to Kenya. 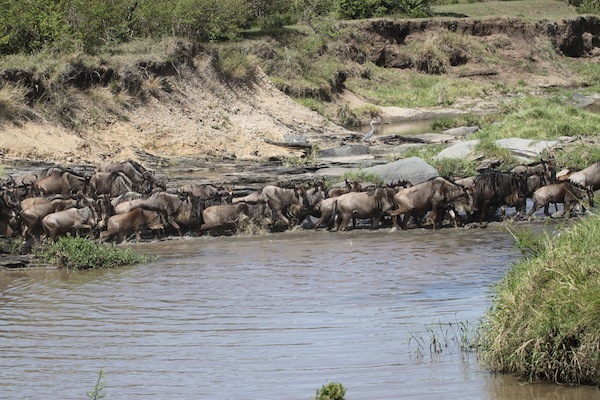 A good view of the large herd we loved watching while on the Kitirua Conservancy. 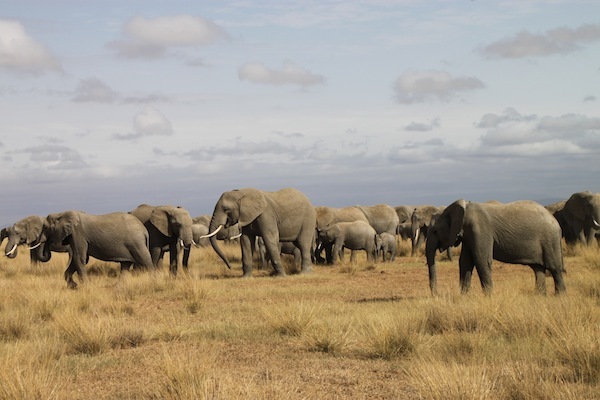 During the trip, elephants got a lot of our attention, in part because our itinerary also included Amboseli National Park and the private Kitirua Conservancy that abuts it. 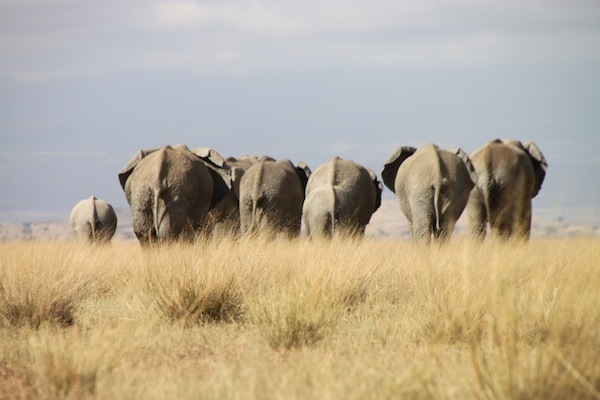 The Amboseli area is noted for its large elephant herds, but those herds are only large compared with other areas, not with herds of the past. The Amboseli elephant herd as we sat among them, with a young one front and center. Our driver/guide at Amboseli, Joseph, passed along interesting trivia about elephants and frightening information about their fate, past, present and possibly future. Starting with the fun factoids, he said the relative lengths of an elephant’s tusks indicate which tusk is most used, i.e., a shorter left tusk means the elephant is essentially left-handed. The elephant’s trunk has 65,000 muscles and 3,000 nerve endings. As for their fabled memories, Joseph said elephants don’t forget the scents of other animals or humans. He said you could blow a few times into the trunk of a baby, and the baby will remember you decades later. 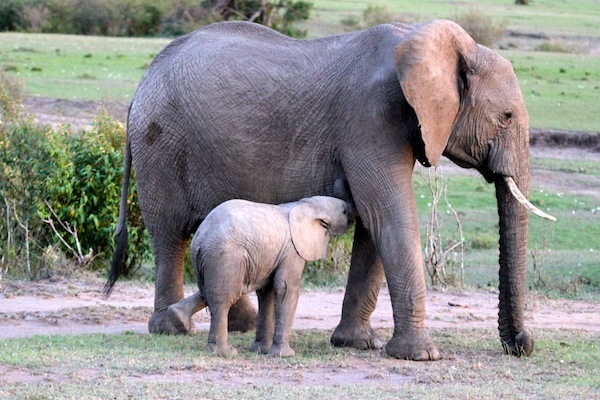 This mother-and-child pair seen in real life on the Maasai Mara were better than any YouTube clip. 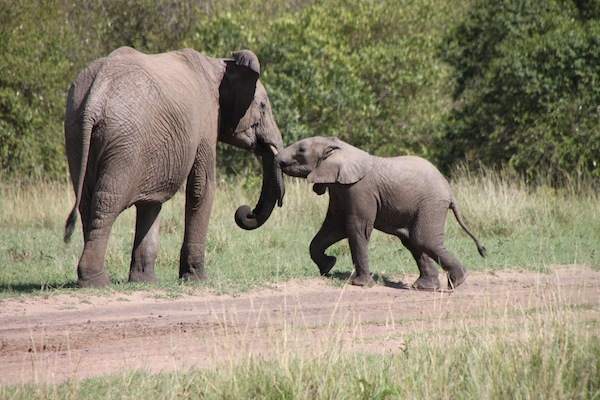 The youngster tried vigorously to engage his mother in play. He then entertained himself by walking a few steps forward, then walking backwards, then repeating the process a few times. Separately, we were told elephants have six sets of teeth in a lifetime, each good for a decade, after which they cannot live much longer. In the 1960s, Amboseli National Park was host to 40,000 to 45,000 elephants, but now the park is down to around 1,600, Joseph said. 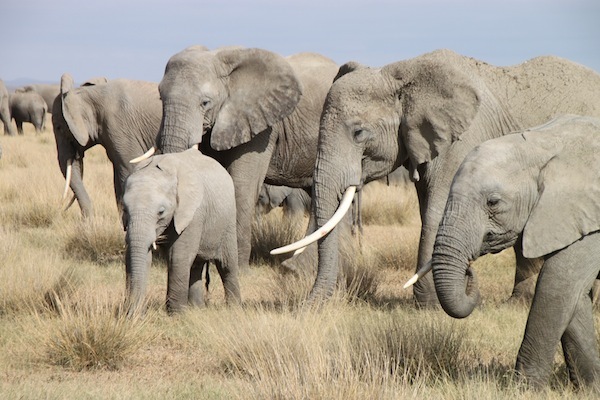 Poaching is the major problem, but not in Amboseli itself, where the elephants benefit from 24-hour monitoring. A toddler, seen on the Maasai Mara, nurses with one foot lifted off the ground as if he were about to dance. Our guide said the lifted foot indicates contentment. 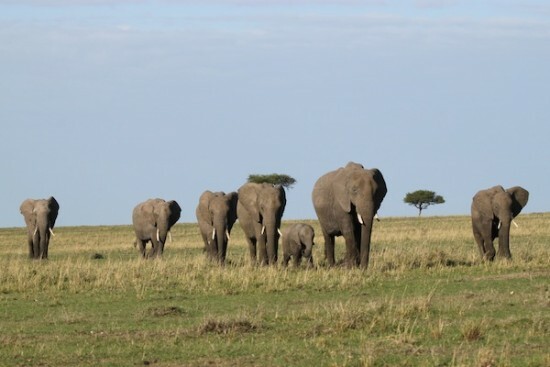 The problem, Joseph said, is that the elephants, which require 600 pounds of food daily per adult, must move around to eat, and that includes crossing into Tanzania, where licensed game hunting is legal. Poachers take advantage of that, he said. 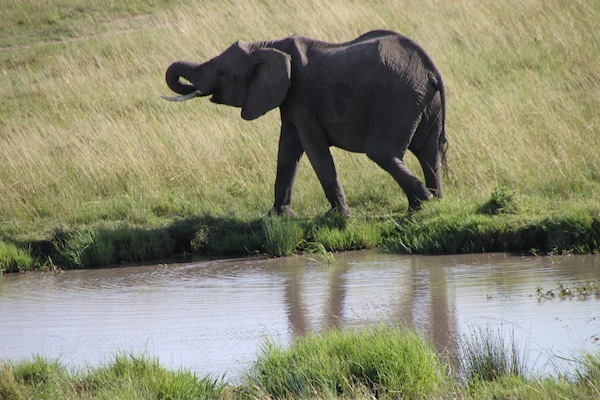 An elephant wraps up a drinking session at a waterhole on the plains of the Maasai Mara. Although continued severe drops in elephant numbers could render them extinct in a decade, Joseph said he is hopeful that “international intervention” will be effective enough that the elephant population will actually grow in the next 10 to 15 years. 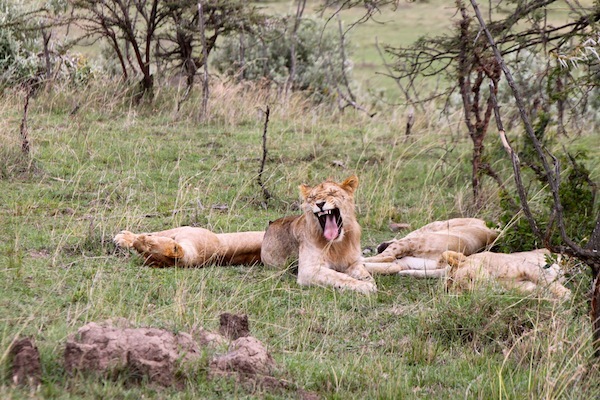 And, by the way, another guide, Duncan, said the Big Five, meaning the large species tourists traditionally most want to see, originated as hunters’ top targets: the lions and leopards for their skins; rhinos for their horns; elephants for their tusks, and buffalo because they are so dangerous. 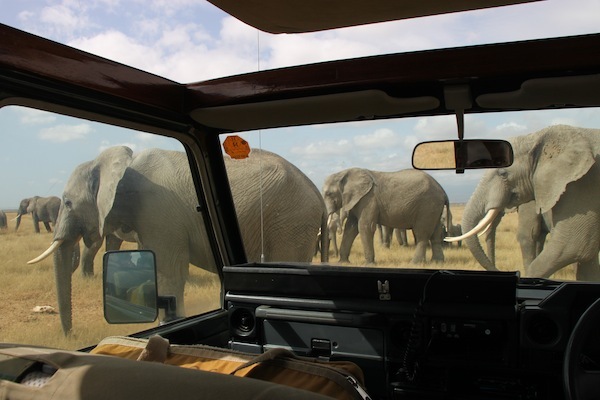 During our game viewing on Kitirua Conservancy, Joseph drove into the middle of a large elephant herd and we could get great close-in photos of very young elephants and others, plus one youngish male that was very curious about our vehicle. He moved his trunk across our windshield, probably checking for a memorable scent! Elephants mill around our four-wheel drive on the Kitirua Conservancy, which is adjacent to Amboseli National Park in southern Kenya. Our guides said the animals see our vehicles, and even our tents, as big boxes, and these “boxes” don’t have odors that frighten them. One of the orphaned elephants at David Sheldrick Wildlife Trust’s orphanage for elephants and rhinos runs to a feeding stall where he knows he will be bottle fed his evening milk. The orphans will be relocated to Tsavo National Park at around age 4 or 5 with more flexibility to meander in open spaces and decide for themselves when they will join a wild herd. We also saw one of the rhino orphans, the blind 9-year-old Maxwell, now adult sized, but he cannot be returned to the wild as he cannot take care of himself. 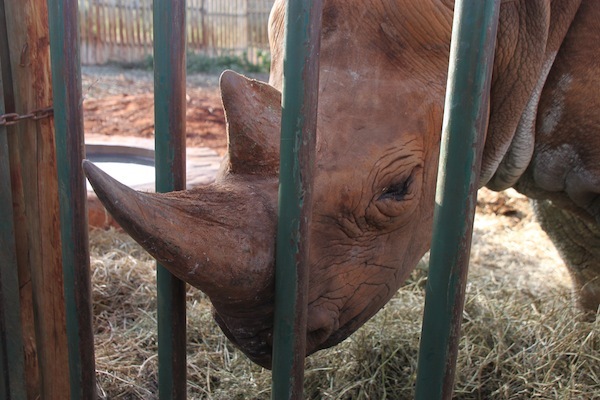 Maxwell, the abandoned and blind rhino, makes himself available for attentions from his human visitors. Maybe I am anthropomorphizing, but I thought he looked sad and seemed to take consolation in leaning against the fence surrounding his corral and letting people pet him or touch his horn through the fence. It costs only $50 a year to foster one of the Sheldrick orphans, a drop in the ocean when measured against the challenges. We receive regular updates on the progress of our fostered animals. 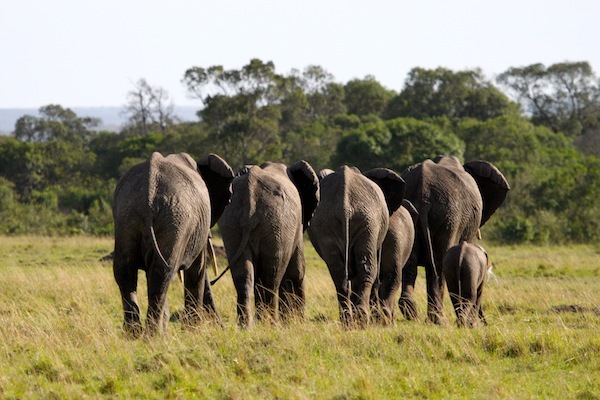 Time to leave now: A group of elephants walking away from us on the Maasai Mara. Ditto for a group on Kitirua Conservancy. In the Marrakech souks, a display of light fixtures that are so bright one may wonder if electricity is necessary! 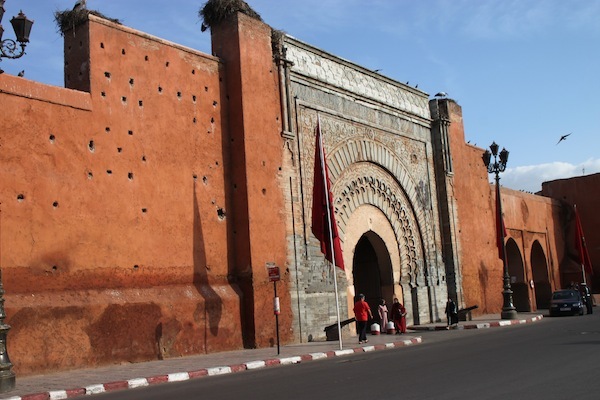 MARRAKECH, Morocco — I returned to Marrakech in late 2012, more than 30 years after my first visit in 1980. I even stayed at the same hotel, La Mamounia, an elegant property just inside 12th century city walls. Bab Agnaou, one of many gates in Marrakech’s city walls.